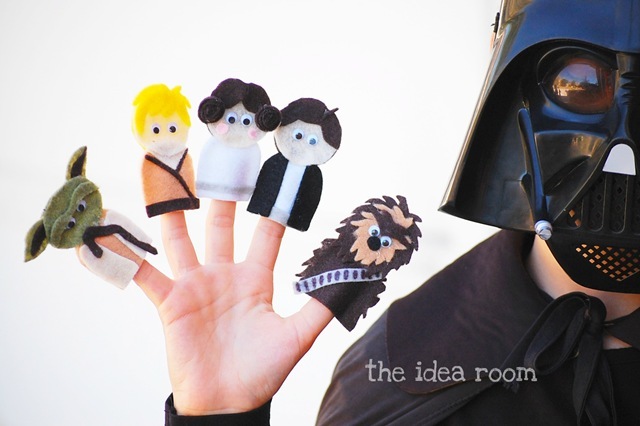 Halloween characters come to life when your kids play with these adorable Star Wars Finger Puppets. 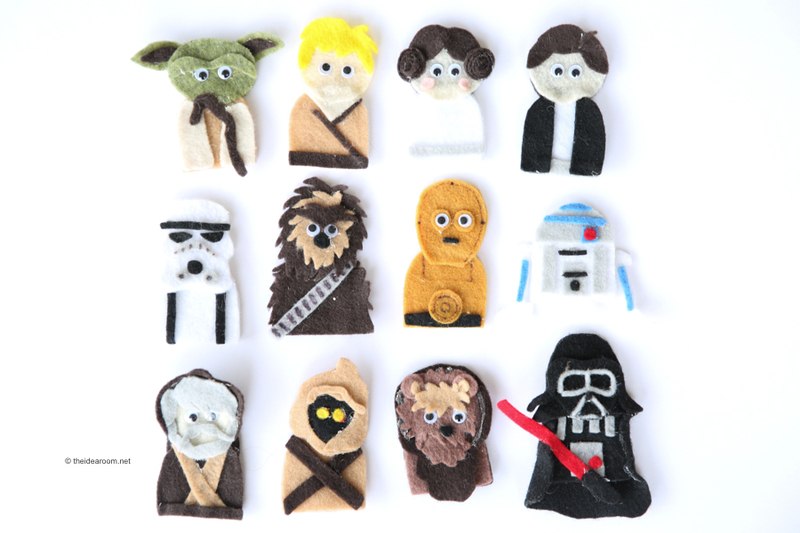 Download your own Star Wars Finger Puppet Patterns for your kids to play with! My boys…and their father, are obsessed with all things Star Wars. They enjoy watching the shows together and playing with their Star Wars toys and Star Wars Characters. There are also many lightsaber fights that can get pretty intense! Ha! 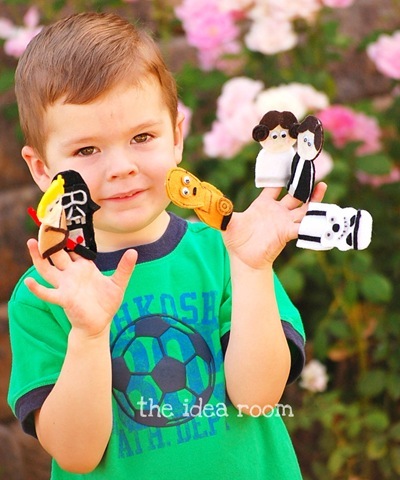 So I thought my boys would enjoy a more quiet way to play their favorite games…with these Star Wars Finger Puppets. I love a good challenge and it was fun to create them for my boys to play with. 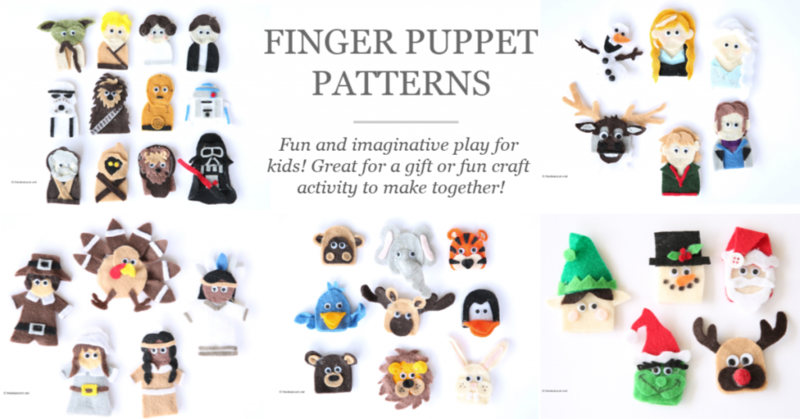 The Star Wars Finger Puppets have been one of my most popular posts of the years! They are perfect for kids of ALL ages to play with and enjoy! Everyone should have a set of these in their home. They also make a great gift idea for the Star Wars fans in your life! Are you interested in making some of your own? Or do you want to re-create the exact Halloween finger puppets I made? I have created a Halloween finger puppet pattern to share with you for those of you who are interested. They are so easy to make and can provide hours of entertainment! They are fun to put together by yourself or as a family activity! Oh my goodness, Amy! I LOVE these! I have BIG (and little) Star Wars fans around there who would LOVE these! Thank you so much Sara! Seems like there are a lot of fans out there. So good to hear from you. Hope all is well! Thanks Gina! I really appreciate ALL of your comments…this one included. And yes, I do recognize you as one of my faithful commentors and readers. What a great concept! I’m impressed by their likeness to the characters. So glad I am not the only admitted non star wars fan :)! So glad you love them. Hope they enjoy playing with them together. Those are going to be very popular! Cute idea! Thanks Noreen. They were a lot of fun to make. I hope that others will enjoy using them with their families! My boys were glad there was finally a craft just for them! these are awesome. Any idea what age this would be a good craft for? I am worried my star wars loving godson would have a hard time cutting out the shapes. Also is it just a lot of gluing or is sewing involved? Thanks I love them! OH MY GOSH…those are the cutest. I have a toddler…but, my 9 year old will love them even more! My son will love these! He just turned 5 & is obsessed with star wars! Had a cool star wars party a couple weeks back (posted on my site) ….These would have been great for the party! These are so fun!! Pretty sure I need to be buying these patterns. Also wanted to let you know I featured these on my blog today! I am pretty sure that your comment made me happy! Thanks so much for the feature! And thanks for purchasing them! These are so cute! I’m a Star Wars fan and my bff too! I’m making these with her. Thank you for the patterns! I finished making the Star Wars patterns and a few of the animals for my nieces and nephew. I was so inspired by your work that I made some finger puppets inspired by Tangled. Thanks again! These are ADORABLE!!! Are they glued or sewn? These are glued with hot glue. But could be seen if you prefer that. I have had people do them both ways. Oh my goodness! My 4 year old daughter is obsessed with Star Wars. I’m ordering the pattern now.. I hope there isn’t too much sewing to be done on these, but I think it would be worth it regardless. Yay! No sewing at all!! I hope she loves them! Thanks for ordering them!